The Futura Nonstick Cook-n-Serve Bowl elegantly offers the concept of Cooking and Serving in Nonstick. The unique combination of 4 mm thick base and sides and superior Nonstick coating allows for a wide variety of food preparation. 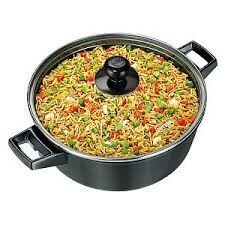 The Futura Nonstick Cook-n-Serve Bowl is suitable for Biryani, dum cooking, preparing rice, pilau and khichdi, making stews, curries, cabbage rolls, stuffed vegetables, and also for sautéing vegetables, seafood, chicken and meat.